Will you be delighted or dreary if someone beckons you, “As Cool as a Cucumber”? I would rather recommend you to take pride when somebody calls you with that phrase because it simply means the attitude of being calm, composed and in absolute control of your emotions, even if a particular situation demands your aggressiveness and anger. This is because Cucumber is one among the coolest fruits as scientific facts state “the inside temperature of a Cucumber can be up to 20 degrees cooler than the outside air”, besides growing well in tropical conditions. Called as Kantakiphalam, Svetakarahatakam, Mutralam and Sudhavasah in Sanskrit, Cucumber is commonly called as Kheera in the traditional healing methodology. 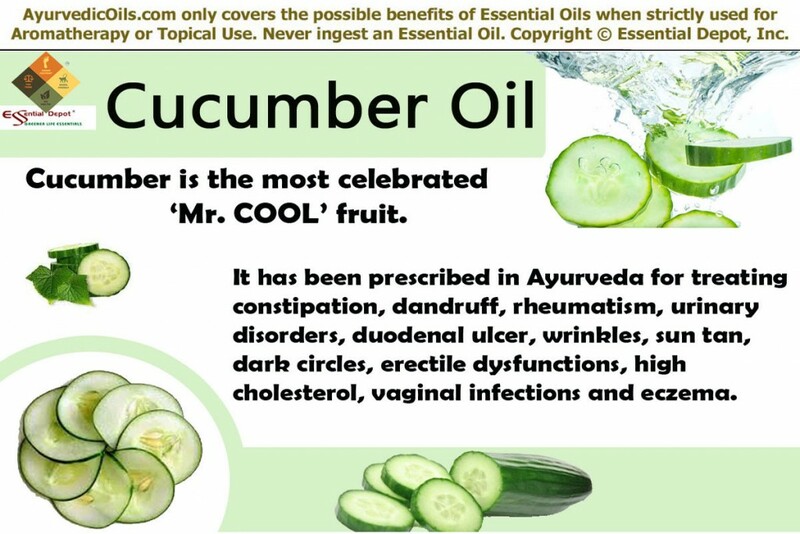 Proudly representing India as its Motherland, Cucumber has been a part of the ancient Ayurvedic regimen in the treatment of rheumatic conditions, constipation, urinary disorders, cholera, wrinkles, dandruff, arthritis, vaginal infections, loss of appetite, duodenal ulcer, erectile dysfunctions, high cholesterol, eczema and hyperacidity. Cucumber, as far as its history is known to the world is said to be a 3,000 years old fruit variety of the gourd family, cucurbitaceae. Besides its use in culinary, Cucumber has been preferred for raw eating, mainly for its cool, mild and enhancing flavor. This cylindrical fruit is a powerhouse of various nutrients, for which it has been used in various civilizations across the world including the Rome, Israel, Greek, Egypt, The United Kingdom, France, China, and USA. The three famous varieties of this creeping vine are pickling, slicing and burpless cucumbers. Cucumbers are absolutely edible and are found across the globe, all around the year but the high seasonal growth curtails to May – August. Pliny The Elder, the Roman philosopher quotes that Cucumber is the most favorite fruit of the Roman Emperor, Tiberius. His gardeners grew cucumbers using artificial methods, just to ensure that the king had cucumbers on his table every day. It is being said that cucumbers were used in the primordial Roman province for treating more than 40 medical conditions, including scorpion stings, blurred vision, frigidity, high blood pressure and diabetes. The Biblical reference of cucumber goes like this “We remember the fish, which we did eat in Egypt freely/the cucumbers, and the melons, and the leeks, and the onions, and the garlic.” After which the Israelites started cultivating cucumbers by themselves. Certain sources state that cucumbers were brought to Haiti in 1494 by Christopher Columbus and were cultivated by the early Spanish settlers. South and North Dakota boasts for owning the finest cucumber farmers of Native America. These fresh and refreshing fruits are often used in making salads (Indian raita), sauces, pickles, cold soups, sausages, chutneys, lamb chops, relishes and dressings. 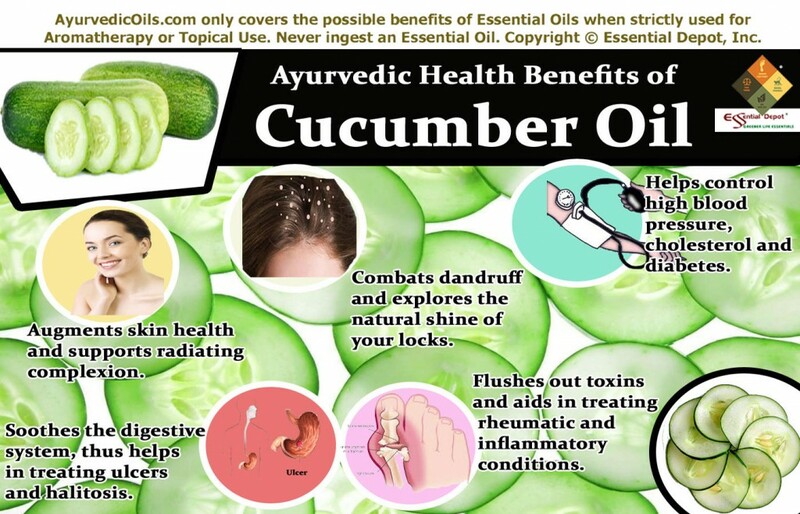 Cucumber and its essential oil are also used in the manufacturing of soaps, moisturizing lotions, anti-dandruff shampoos, conditioners and skin care creams, especially anti-aging products, for its nourishing properties. The oil of Cucumber contains about 14 to 20% of oleic acid, stearic acid, palmitic acid and 60 to 68% of omega-3-linoleic acid. It also contains potassium, silicon, cucurbitacins, sulphur and certain fatty acids like 9, 12, 15-Octadecatrienoic acid and 9, 12-Octadecadienoic acid. Cucumber oil has antioxidant, diuretic, anti-rheumatic, anti-ulcer, relaxing, antidote, rejuvenating, anti-stress, anti-inflammatory, anti-cancerous, tonic, anti-dandruff, and laxative properties. It is rich in Vitamins B1, B2, B3, B5, B6, and C along with magnesium, calcium, phosphorous, zinc, iron and folic acid. Next time, when you are exhausted and drained out, stop sliding on toxic caffeine drinks, instead grab a Cucumber and bank upon it for all your nutritional requisites. Ayurveda and Cucumber share the mutual joy of being indigenous to India, the land of rich cultural heritage. This oldest healing science on the globe states that everything on earth is made up of the five vital elements of nature, namely fire, water, earth, space and air. Among which the living things on this planet acquires prana, the vital energy of life and ojas, and the nutritive quintessence from Mother Earth. While animal and human beings utilize prana and ojas for vitality and livelihood, plants grab ojas and prana from the ground and renovate them as food, herbal medications and essential oils for the absolute well-being of all other organisms. The greatest news about the nobility of plants and trees are that they capture enormous life force and spiritual energy straight from the space by constantly looking up to the sky. Thus, any source of food or medicines acquired from plants instills the purest form of energy directly to our soul. It is because of this reason; we call invigorating plant fragrances (especially from essential oils, the life essence of plants) as soulful aromatic substances. Cucumber is a bundle of joy and instant coolant that refreshes everyone even on a bright sunny day. It bears all the heat in the atmosphere, yet remaining absolutely cool in the inside makes it a special fruit with enormous healing attributes and nutritional values. India, being a country of tropical climatic conditions, rests upon Cucumber to quench its thirst and no Indian summer is complete without Cucumbers on the street. Being a complete traditional remedy, Ayurveda regards health as a combination of physical, emotional and spiritual wellness and this ideology is based upon its philosophy of considering the human system as a place of worship or temple. Ayurveda believes that the soul vested within each of us connects with Divinity and this connection or synchronization is the rationale behind hale and heartiness. Ayurveda says that every individual is made up of three distinct doshas (vata, pitta and kapha) or biological energies. The most predominant among the three doshas acts as a deciding factor for your personality, character and behavioral traits. Imbalance of any one of these doshic elements end up in health problems signaling that the body is out of balance with nature. Imbalance of vata dosha can end up in memory loss, lack of concentration, fear, insomnia, dry skin, restlessness and constipation. Pitta unevenness might lead to disgust, ulcer, anger, heartburn, high blood pressure, jealousy, fever and skin ulcers. Fluid retention, toxic remains, congestion, sluggishness, delayed menstruation, uterine fibroids, obesity and procrastination are the results of Kapha vitiation. Cucumber oil has pacifying effects on pitta and kapha dosha. The cooling and refreshing properties of this oil can help in treating high blood pressure, heartburn, ulcer, fluid retention, skin eruptions, constipation and stress. Cucumber is absolutely a treat for the four senses of healing, whereas its lucid green color soothes the sense of sight, it’s refreshing taste energizes the sense of taste, its cooling properties penetrate deeply into the skin to transfer its therapeutic values through the sense of touch, it’s refreshing aroma reaches the limbic system in the form of aromatic molecules to control emotions. Cucumber oil has stupendous revitalizing and nourishing properties that help in treating dull, damaged or mature skin conditions. The presence of linoleic acid and oleic acid in cucumber makes it an excellent aid for skin problems including acne, blackheads, sunburns, psoriasis, eczema and certain other inflammatory skin conditions. The antioxidant properties of cucumber oil are attributed to the significant existence of tocopherol and tocotrienol substance along with the three lignans including secoisolariciresinol, lariciresinol and pinoresinol. These elements make Cucumber oil powerful in fighting against the free radicals responsible for aging symptoms, skin damages and several types of cancer, including ovarian cancer, prostate cancer, breast cancer and uterine cancer. Massaging your skin with 10 drops of Cucumber oil blended with 2 drops of Orange oil and 4 ounce of coconut oil can help in retaining the natural moisture in the skin, repair dry and dull skin surface, treat eczema, psoriasis, rough, scaly and mature skin, reduce wrinkles, aging symptoms and skin eruptions. A 2011 study on “Exploring Cucumber Extract For Skin Rejuvenation” by Naveed Akhtar, Arshad Mehmood, Barkat Ali Khan, Tariq Mahmood, Haji Muhammad Shoaib Khan and Tariq Saeed, Department of Pharmacy, The Islamia University of Bahawalpur and the Department of Pharmaceutical Sciences, COMSATS Institute of Information Technology, Pakistan, Published in the African Journal of Biotechnology, states that cucumber extract has been proven extremely beneficial for the skin. These experts also say that Cucumber extracts have passed the maximum number of dermatological tests including skin melanin test, skin erythema test (safety of cosmetics), pH tests, skin moisture content test, skin sebum content test, and trans epidermal water loss test. This study concludes stating that this was a preliminary initiative in exploring the unknown effects of Cucumber as a topical cream for skin rejuvenation. It also states that cucumber extracts aid in reducing the melanin content (responsible for skin pigmentation and complexion); has anti-acne effects with its potent to decrease the content of skin sebum. This study also declares that these analyses have proved to be capable in the context of prospective topical applications of cucumber extract (with its varied skin care properties), as cosmetics, skin-care items and in the manufacturing of pharmaceutical preparations. You can also add 2 drops of Cucumber oil in a cup of cool water and wash your face for locking the moisture and fight against acne causing micro-organisms. Bouncy, strong, silky and dandruff-free lustrous locks are the dream of many women out there. Men are not an exception though, in longing for healthy hair that is free from hair loss, dandruff and other scalp conditions. Cucumber is one among those natures’s richest owner of the minerals like silica and sulphur, of which sulphur is known for promoting hair growth and silica fortifies the hair follicles and protect from breakage and loss of hair. Silica is an essential element for supporting the health of connective tissues like skin, muscles, ligaments and bones. The moisturizing properties of Cucumber oil helps in hydrating the scalp and aids in reducing dryness, itchy and flaky scales on the scalp surface and nourishes the scalp and roots of the hair from within. Massaging your scalp with 5 ounce of Cucumber oil mixed with 5 drops of Rosemary oil and 5 drops of Brahmi oil and leaving it for 1 hour by wrapping a warm towel (helps the medicated blend to penetrate deeply into your scalp) can assist in reducing dandruff, replenishing the scalp, enhancing the luster of your hair and prevent excessive hair fall. You can also add 5 drops of Cucumber oil in your mild shampoo for fastening the natural moisture in your hair for a longer duration. This blend can be applied by the swimmers before their swimming voyage in the chlorinated and chemical filled water. This helps in preventing the hair damage naturally. Certain studies witness that the presence of sterols in Cucumbers may help in reducing the high level of cholesterol, while the presence of fiber, magnesium and potassium assists in treating high blood pressure. Cucumber also stimulates the secretion of insulin hormones in the pancreas, thus assisting in the treatment of diabetes. Eating fresh cucumber daily along with adding 5 drops of Cucumber oil in your liquid soap can help in vitalizing your cells and augment your energy levels. Cucumber oil has the power to soothe and pacify pitta dosha. The excess of which would end up in overindulgence of digestive fire leading to ulcer, high blood pressure, acidity, heartburn, acne, negative emotions, feelings of rage, insomnia, acne and certain other skin eruptions. Massaging your abdomen and chest with 10 drops of Cucumber oil blended with 2 drops of Peppermint oil can help in cooling the digestive system (intemperance of digestive fire) by soothing the lining of the stomach and intestines. Using 2 drops of Cucumber oil in warm gargle can assist in fighting against bad breath with the presence of phytochemicals. Cucumber has enormous amount of ascorbic acid, contributing to its diuretic properties. This moisture-rich oil helps in replenishing the system with its anti-rheumatic, antioxidant and diuretic properties by flushing out the excess fluid deposits, toxic remains, salt, uric acid, free radicals and fat deposits in the system, which is often responsible for inflammatory conditions like gout, rheumatism, arthritis, swelling, redness, obesity and puffy eyes. Massaging the affected parts with 5 ounce of Cucumber oil with 5 ounce of Sweet Almond oil can help in promoting frequent urination, thus eliminating toxic remains, free radicals, salt, fat deposits and uric acid, which helps in reducing swelling, skin irritations, muscular soreness, pain, redness and muscular stiffness associated with rheumatism and arthritis. Pranayama or the art of balanced breathing can help highly in expelling ama or excess toxic substances in the system, where all these toxins are discharged through exhalation. Inhaling the refreshing fragrance of Cucumber by adding 2 drops of this oil in your air freshener, especially during Pranayama and meditation can grant quicker relief by releasing your mind and body from toxic emotional blocks and harmful toxins in the system. Cucumber is also helpful in treating vaginal itching, erectile dysfunctions, heart problems, renal calculi, cancer therapy, dark circles, urinary infections, cholera, and cellulites. This piece of information is meant only for the purpose of information and is not recommended to treat or prevent any kind of medical conditions. It is not meant to replace any prescription medicines or the advice of a medical professional. We, the team of Essential Depot are not experts in Remedial practices or Traditional medicine and these facts are shared only for spreading the greatness of Ayurveda in treating mankind. Essential oils are recommended only for topical applications and do dilute essential oils in suitable carrier oils before using it on the skin. Never ingest essential oils as absolutely pure and organic essential oils are highly concentrated substances and may cause allergic reactions, when used internally or on the skin without dilution. Speak with your Ayurvedic expert or medical professional before choosing the right essential oils for your state of health and unique individual constitution. Performing a patch test on your skin before enjoying its complete benefits is an amicable advice. – By Pedro Calderon de la Barca. This entry was posted in Essential Oils - Learn About and Purchase and tagged 5 Ayurvedic uses of Cucumber oil, 5 health benefits of Cucumber oil, Ayurvedic health benefits of Cucumber, Ayurvedic oils for acne, Ayurvedic oils for constipation, Ayurvedic oils for dandruff, Ayurvedic oils for detoxification, Ayurvedic oils for diabetes, Ayurvedic oils for hair fall, Ayurvedic oils for hair growth, Ayurvedic oils for heartburn, Ayurvedic oils for mature skin, Ayurvedic oils for rheumatic problems, Ayurvedic oils for ulcer, Ayurvedic oils for urinary infections, Ayurvedic oils for wrinkles, Ayurvedic uses of Cucumber oil, Chemical constituents of Cucumber oil, Cucumber and Ayurveda, Cucumber in Ayurveda, Cucumber oil in Ayurveda, Cucumis sativus, Health benefits of Cucumber, Health benefits of Cucumber oil, History of Cucumber, Natural oils for dandruff, Natural remedies for dandruff, Therapeutic properties of Cucumber oil by AyurvedicOils. Bookmark the permalink.